The last few days have seen a number of reports in the national press about wine ‘faults’ caused by screwcaps, not only in the UK (Times, Daily Mail, Daily Telegraph, BBC News Site), but also in New Zealand and Australia. I feel strongly that there is a need to address these reports because, in my opinion, they represent the science of closures badly, are filled with inaccuracies and misunderstandings, and do not serve the wine industry well: they have the potential for misleading consumers about an important issue. The reports are centred on the results from the faults clinic at the International Wine Challenge. It is puzzling that this story should suddenly be deemed ‘news’: the results were actually released last September (see here), and were given some press coverage then. My concern is that while the issue of screwcap reduction is an important one that needs to be addressed by the industry, the reality is rather different (and rather more complex) than the one portrayed by these news reports. Significantly, the pieces fail to recognize that screwcaps with liners allowing different oxygen transmission rates exist, and that winemakers can work with their wines to bring them to a point at bottling where reduction is much less likely, even if they use the tin-lined screwcaps that are currently the most popular sort and which allow very little oxygen transmission. Also, when reduction does occur, it is not the same as cork taint, which irredeemably ruins a wine, but is rather a more subtle effect that almost all consumers would fail to spot. I’ll address the specific points raised in two of the news pieces below. The problem with screwcap reduction, when it occurs, is the presence of disulfides and thiols (this is another name for mercaptans). Typical descriptors for these are ‘burnt match’, ‘struck flint’, ‘rubber’ – not rotten eggs (see the table below). The latter is a descriptor for hydrogen sulphide. Hydrogen sulphide is caused by reduction: a lack of oxygen in fermentation, or an absence of other nitrogen sources means that yeasts use the amino acid cysteine as a nitrogen source, producing hydrogen sulphide. Hydrogen sulphide is then reduced to disulfides, which in turn can be reduced to mercaptans. In the reduced environment of a wine sealed by screwcap you’d be unlikely to see eggy hydrogen sulphide, unless the winemaker was negligent to bottle an already reduced wine this way. 2,4,6-trichloroanisole is not a mould. It’s a compound produced by microbes that live in the lenticels of cork bark. No, there were 10 000 bottles opened overall, and of these, 2.2% of those sealed with screwcaps (a much smaller number) were found to have sulfide issues. This was sensory analysis only. No bottles were subjected to chemical testing. The dreaded ‘sulphidisation’ term was not used anywhere. Wrong. Sulphur smells of sulphur. Thiols smell quite different (see table below). No. This is wrong, in my opinion. He’s confusing hydrogen sulfide with the other sulfur compounds. I’ve tasted a number of wines with what I suspect to be screwcap reduction, and it’s not as noticeable as cork taint. I doubt any consumers will spot it unless they are coached. Certainly, the 2.2% of screwcapped wines picked out at the IWC weren’t suffering from eggy/drainage hydrogen sulphide smells. Both quite similar sentences, which makes me think that the journalists were working from a press release sent in, or reworked the same original article. Who was the author? Anyway, it’s wrong again. The author fails to distinguish that there are different sorts of screwcap liner. Those with a tin layer in the liner (the majority) allow very little, but some, gas transmission. Those with a saranex-only (white-looking) liner allow a good deal more. 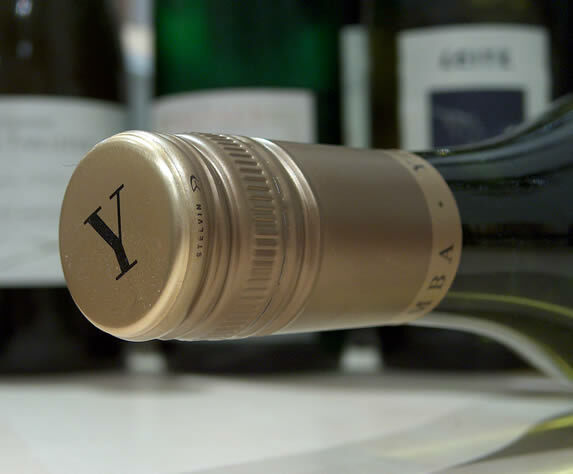 Screwcap manufacturers are looking at engineering liners with intermediate gas transmission, but no one would think of allowing ‘more room around the head of the bottle’ because this would cause the wine to oxidize fast! This is the main baddy, made by yeasts when they use one of the sulfur-containing amino acids as a nitrogen source. Stress also encourages its formation. This is a large group of very smelly sulfur compounds. Terms such as cabbagey, rubbery, struck flint or burnt rubber are used as descriptors. If hydrogen sulfide isn’t removed quickly, it can result in mercaptan production. This is a big worry for winemakers. Often negative, but can be positive in the right wine environment at certain levels. Cooked vegetables, cooked corn, canned tomato at high levels; blackcurrant drink concentrate at lower levels. Quince, truffle. Tropical fruit/passion fruit at low levels; cat’s urine at higher levels. Common in Sauvignon Blanc but also found in red wines where they can contribute to the blackcurrant fruit aroma. An example of sulfur flavours that can be positive in the right environment.